Participants: Total 29 from 8 countries, i.e. China, Indonesia, Japan, Korea, Malaysia, the Philippines, Thailand and Vietnam plus 7 observers from Malaysia. The opening session began with the remarks by Dr. Mohd Nazir Basiran on behalf of MINT, Ms. Miwako Shimizu on behalf of MEXT, followed by the o pening address by Dr. Daud Mohamad, Director General of MINT on behalf of YB Dato' Sri Dr. Jamaludin bin Mohd Jarjis, the Honorable Minister of Science, Technology and Innovation, Malaysia . The official opening ceremony was followed by “Memorial Speech for the late Dr. Tano” and “Overview of FNCA Mutation Breeding Project” presented by Dr. Hitoshi Nakagawa, Project Leader of Japan as introduction to the Workshop. Progress reports on “Drought Tolerance in Sorghum” were delivered by China, Indonesia and Japan. Keynote speech on Soybean was delivered by Prof. Yutaka Takagi, Japan, followed by progress reports on “ Drought Tolerance in Soybean” by Indonesia, Malaysia, the Philippines and Vietnam. “ Present Status and Future Work Plan of the Sub-Project on Drought Tolerance in Soybean and Sorghum” were discussed and the points discussed are included in “Summary of Sub-Project Activities” . The points agreed upon are summarized in “Minutes of Workshop” . Four Special Topics were presented by Japan, Korea and Malaysia as follows. The details of presentations are summarized in “Minutes of Workshop”. “Research Progress and Current Status of Mutation Breeding in Korea” by Dr. Si-Yong Kang , Korea. 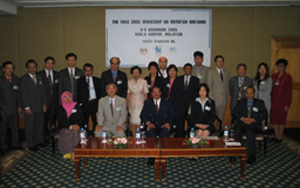 Report on the sub-project meeting on Insect Resistance in Orchid which was held on September 5-8, 2005 in Bangkok, Thailand was presented by Prof. Siranut Lamseejan, Thailand. After presentation, mid-term report on orchid and future working plan were discussed and accepted. Publications including the country reports from each participating countries for the proposed MUTATION BREEDING PUBLICATION DATABASE should be submitted to FNCA secretariat by the end of April 2006. The Mutation Breeding Database is not ready to be shared outside of FNCA network due to confidentiality of certain information. The hard copy of the Mutation Breeding Manual was distributed to every participant and it was suggested that the Mutation Breeding Manual be registered for ISBN number, though it is recommended that FNCA acknowledges the use of materials and references from outside sources. In phase IV, the mutation breeding activity will be focused on problem solving project. The FNCA 2006 Workshop for Mutation Breeding will be hosted by Japan between late August and early September. Korea will host the 2007 Workshop. The sub-project meeting on Insect Resistance in Orchid held in Bangkok was found to be very beneficial, therefore the sub-project meeting on Disease Resistance in Banana will be held separately in the Philippines in July 2006. Suggestion that Project Leaders should lead at least one sub-project that the country is participating in was made by FNCA. The proposed project “Composition or Quality Crop Breeding” was selected as a new project to be implemented from 2007 on mainly rice, soybean, wheat and sorghum etc. Initially all countries (China, Indonesia, Japan, Korea, Malaysia, the Philippines, Thailand and Vietnam) have agreed to participate in the project, which will be discussed further until the next workshop. Participants made a visit to Gamma Greenhouse construction site at MINT with a briefing on the gamma greenhouse as well as the ongoing construction work at the Gamma Greenhouse by Dr. Rusli Ibrahim. In conjunction with the invited lecture on “Mutation Breeding of Roselle in Malaysia” by Dr. Mohamad Osman, the participants visited the Roselle ( Hibiscus sabdariffa ) experimental plots at Universiti Kebangsaan Malaysia, to observe the screening and evaluation of Roselle mutants. All participants had the chance to see the plants in the field, demonstration of various Roselle products and tasted Roselle juice and dried sweet pickles. Participants also visited Kulim Montel Farm, Kluang, Johor and Malaysian Agricultural Research and Development Institute (MARDI), Pontian Station, Pontian, Johor. At Kulim Montel Farm, Mr. Roslan Osman, The Farm Manager, briefed all participants on the operation of the banana farm, including the packaging process. At the MARDI station, a research officer, Ms. Kogee gave brief information of research activities at MARDI Pontian. 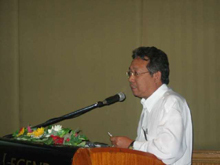 This was followed by a presentation by Dr. Chan Ying Kwok on the project on papaya improvement at MARDI which include the application of mutation breeding technique. The participants were given the opportunity to visit The Pineapple Museum as well as pineapple and papaya planting plots. Dr. Chan also gave a demonstration on the techniques for pollinating pineapples. Participating countries (Indonesia & China) have developed total eleven (Indonesia 10, China 1) mutant lines having desirable agronomic traits, good quality and tolerant to drought. These breeding materials have been exchanged between counterparts of Indonesia and China for breeding program. 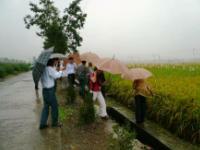 Demonstration plots for the released sweet sorghum mutant variety (Yuantian 1) were conducted in China. In Indonesia, seed multiplication of drought tolerant mutant lines was conducted by project counterpart i.e. LIPPO enterprise for multilocational trials. Ion beam induced breeding materials are now being studied in Indonesia, China and Japan. The same ion beam irradiated materials are being evaluated in Indonesia and Japan. Sorghum based industry for food, animal feed and materials has been developed in each participating countries. This will give significant impact to farmers and could promote economic growth. For The Philippines, six promising mutant lines have been selected in the local varieties (PSB-Sy5, BPI-Sy4 and PSB-Sy4) and in Vietnamese varieties (DT-95, AKO-6 and DT-84). Malaysia reported that PSB-Sy4, an introduced variety from the Philippines was selected as a potential candidate because of its earliness and drought tolerance. According to Indonesia, the control variety has 2.22tons/ha yield which was higher than all the materials tested. M220 is a promising mutant line with a yield of 2.14tons/ha. The yield was better than the introduced line. The M220 will be further developed for drought tolerance and higher yield. Vietnam reported that there were 10 mutants and hybrid varieties that have been released that contributed to increase in soybean yield. Recently, Institute of Agricultural Genetics (IAG) is applying gamma radiation in 3 soybean varieties (DT96, DT2001 and D.158) for drought tolerance studies. Mutant lines with drought tolerance have been selected. In Korea, registration of a newly developed plant variety needs to go through the National Seed Management Office, which is under the Ministry of Agriculture and Forest. In Korea, it takes at least 10 years duration for breeding and 2 years for registration of a new variety and the released varieties are protected. Korea mentioned that an average of 5 tons /ha of rice yield is considered breeding target for saline tolerant rice cultivar. In Japan, a new cultivar, LGC1, was developed with a low glutelin and high prolamine content by mutation breeding. Because of the indigestibility of prolamine, LGC1 can be used practically as low protein rice. It is useful for people who must restrict their protein intake, such as patients with kidney disease. The molecular characterization of Low glutelin content 1 ( Lgc1 ) has been reported. Two new cultivars were also developed from a cross between LGC1 and a mutant line that is deficient in 26-kDa globulin. These cultivars were registered with the Japanese Ministry of Agriculture, Forestry and Fisheries. These cultivars have about half the easy-to-digest protein content of regular cultivars. Roselle juice is well accepted by public in Malaysia. Roselle has many beneficial components such as high Anthocyanin, high Vitamin C and may contain HCA (Hydroxycitric acid) that has potential use in slimming products. In Malaysia, grafting of Papaya is a common method to propagate hermaphrodite plants. Fruit from hermaphrodite plants are favoured compared to fruits from male and female plants. 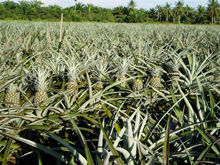 In pineapple micropropagation, l.0 liter temporary immersion and 5.0 liter air-lift bioreactors are used. Publications (full paper or abstract in English) for the proposed MUTATION BREEDING PUBLICATION DATABASE should be submitted to FNCA secretariat by the end of April 2006. FNCA proposal to put the country reports from each participating countries into the MUTATION BREEDING PUBLICATION DATABASE was accepted. The hard copy of the Mutation Breeding Manual was distributed to every participant and FNCA demonstrated and explained how to access to Mutation Breeding Manual through the Internet. Indonesia suggested that the Mutation Breeding Manual be registered for ISBN number. If there were ISBN number, it would be an official publication and made known outside of FNCA circle. However, it is recommended that FNCA acknowledges the use of materials and references from outside sources. Keynote Speech was delivered by Dr. Keiko Natsuaki, Japan, followed by progress reports on “Disease Resistance in Banana ” by Indonesia, Malaysia, the Philippines and Vietnam. In the Philippines, Screening for BBTV has been done for generation 1 & 2 of the promising mutant lines and 2 lines have been evaluated against nematodes. Out of the 43 PR BBTV lines, 13 showed resistance to BBTV under field condition. One PR line each was resistant to nematodes caused by R. similis & M. incognita . For Indonesia, Malaysia and Vietnam, evaluation of promising PR lines resistant/tolerant to Fusarium wilt was done in greenhouse and hot spot areas. In Vietnam 17 promising mutant lines were identified for the resistant for Fusarium wilt under greenhouse condition. In Malaysia, greenhouse screening for Fusarium wilt was done using double tray technique under greenhouse condition. At the same time, 3000 irradiated plants have been screened in hot spot areas in collaboration with a private company, United Plantations Bhd. Those two techniques failed to select resistant plants to Fusarium wilt disease. Therefore, suggestion was made to conduct appropriate greenhouse evaluation to identify putative mutant lines. In phase IV, the mutation breeding activity will be focused on problem solving project. FNCA emphasized on the evaluation for economic and social impacts of the sub-projects. The sub-project meeting on Insect Resistance in Orchid held in Bangkok was found to be very beneficial, therefore the sub-project meeting on Disease Resistance in Banana will be held separately in the Philippines in July 2006. Sub-project meeting should also include experts and users to help researchers on specific problems regarding the project. Korea proposed four candidate projects to be implemented from 2007. Among the four projects, the project “Composition or Quality Crop Breeding” was selected on mainly rice, soybean, wheat and sorghum etc. Initially all countries (China, Indonesia, Japan, Korea, Malaysia, the Philippines, Thailand and Vietnam) have agreed to participate in the project. The format for constructing the new project will be sent from FNCA secretariat and the detail of the project will be discussed further until the next workshop. Participants made a visit to Gamma Greenhouse construction site at MINT with a briefing on the gamma greenhouse as well as the ongoing construction work at the Gamma Greenhouse by Dr. Rusli Ibrahim. In conjunction with the invited lecture on “Mutation Breeding of Roselle in Malaysia” by Dr. Mohamad Osman, the participants visited the Roselle ( Hibiscus sabdariffa ) experimental plots at Universiti Kebangsaan Malaysia, to observe the screening and evaluation of Roselle mutants. All participants had the chance to see the plants in the field, demonstration of various Roselle products and tasted Roselle juice and dried sweet pickles. These visits were followed by field visits to Kulim Montel Farm, Kluang, Johor and Malaysian Agricultural Research and Development Institute (MARDI), Pontian Station, Pontian, Johor. At Kulim Montel Farm, Mr. Roslan Osman, The Farm Manager, briefed all participants on the operation of the banana farm, including the packaging process. At the MARDI station, a research officer, Ms. Kogee gave brief information of research activities at MARDI Pontian. This was followed by a presentation by Dr. Chan Ying Kwok on the project on papaya improvement at MARDI which include the application of mutation breeding technique. The participants were given the opportunity to visit The Pineapple Museum as well as pineapple and papaya planting plots. Dr. Chan also gave a demonstration on the techniques for pollinating pineapples. The Minutes were discussed and agreed upon by all participants in the Workshop. This will be reported at the Seventh FNCA Coordinators Meeting to be held in March 2006 in Tokyo, Japan. Malaysian Agriculture Research and Development Institute (MARDI) Station, Pontian, Johor. Ministry of Agricultural and Rural Dev. Genetics and Upland Crop Breeding Dept. China is using mutant variety for drought tolerance as well as using the mutant to improve its traits ; e.g. e arly flowering, high biomass and high sugar content. Drought tolerance is controlled by multiple genes, thus Molecular Assisted Selection (MAS) technique may be a better approach for tolerant mutant selection following agronomic characteristics selection. Mechanism for drought tolerance is still unknown. It is possible to get mutants for drought tolerance by Mutation breeding ; e. g. in wheat . Although measurement of water potential in the field is a useful technique, it would be laborious and time consuming to measure 1000 or more materials in a short period. Drought toleran t mutant is crucial for areas that are unproductive during the dry season , e.g. paddy field, coastal areas and hilly areas in Indonesia. Other than that, high biomass yielding mutant is also important as alternative income to farmers to overcome food crisis in the world, and for biofuel (ethanol and methanol) production being conducted in China and Japan. China has released 22 plant varieties including 13 rice, 3 wheat, 4 vegetables and 2 sesame cultivars, produced through mutation induction by aerospace experiments. The after effects of sorghum being sent to aerospace in 2006 are being investigated because cosmic rays and conditions may have different effects. China is using 2 kinds of ion beams: single and mixed particles. Simulation of single particle and mixed particles using accelerator to induce variations in agriculture. According to Indonesia, the control variety has higher yield than materials from other participating countries. Promising mutant lines for drought tolerance have been selected in the M4 and M5 generations in both the local (PSB-SY5, BPI-SY4, PSB-SY4) and introduced varieties from Vietnam (DT-95, AKO-6, DT-95). The variety PSB-SY4 given to Malaysia is a recommended soybean variety from the Philippines that has some degree of resistance to certain diseases and is high yielding that has to be tested for drought tolerance. Participating countries in this sub-project are Japan, Thailand, Malaysia and Indonesia. Japan , however, is not doing any research in this project at present but giving technical advice and support for the breeding . Each participating country is working on 1 common commercial variety but at the same time they are also working with their own local varieties. Infestation of Thrips in orchid is the most common in Thailand and the damages are severe. In Thailand, evaluation and screening of insect (thrips) resistance can be done both in vitro and in vivo . But in vitro screening is time consuming and requires more manpower as thrips are very mobile and difficult to control . Natural insect infestation in greenhouse is a better alternative method for screening. 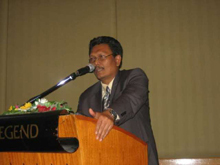 Malaysia is still trying to optimize the in vitro screening method for insect ( mites ) resistance . There are no concrete data available to be used as reference regarding combination of acute & chronic irradiation of Orchids. Thailand is still trying to optimize the dosage. In future, Japan will try to make collaboration with private companies from Japan to support the project. However, faster development in the project is important because timing is crucial for commercialization. 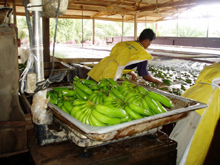 Malaysia suggested that studies on BBTV should be done in the center of banana diversity countries (Malaysia, Thailand, India) as no studies being done yet although Malaysia experienced more severe Fusarium wilt disease. Chemical control of BBTV is available but not practical due to high cost. So development of new varieties through mutation breeding or transformation is crucial. Indonesia reported t hat mutant lines resistant towards F usar ium have selected but the degree of tolerance is still low (60% survival). The double-tray technique was used for selection but was found not effective in selecting for resistant mutants. Thus, Screening is done in the hot spot that has been infected by FOC. In Malaysia, screening is also done in hot spot areas. Malaysia suggested that a better and more effective approach to generate resistance to Fusarium in banana is through genetic engineering by incorporating wild banana genes that is known to be resistant to Fusarium into the commercial varieties. Japan suggested to check not only one particular disease but also the other diseases in banana at the same time . Malaysia inquire d on the lack of collaboration with Korea and China regarding BSV and BBTV research. According to Korea, bananas are planted in Korea only under green house for tourist attraction and there is no potential collaborator from China. The Philippines used virus free materials and quarantine procedure as best field management for BBTV. Japan suggested that each participating countries submit data on economic impact of each disease so that more budget could be allocated in the future projects. The Philippines suggested that selection at molecular level is needed to identify the mechanism of resistance. Vietnam measured the resistance to Fusarium using various techniques, i.e. i njection, double-tray technique. The phenotypes of the mutant population are observed and evaluated. SSR markers will also be used to identify the mutant plants . China and Japan commented that these molecular markers can only be used to check for DNA polymorphism s and these approaches are not efficient now . If there is a need to check or confirm for potential mutant material s , markers of more closely related to the genes should be used. Malaysia suggested that screening for a few generations is need ed to confirm the mutant plant is stable with resistance to Fusarium . If possible, test should be conducted by using four races of Fusarium (1,2,3,4) to ensure that the mutant is resistant to all the races. In Malaysia and Indonesia, race 4 is the most common one . Screening for BBTV has been done for generation 1 & 2 of the promising mutant lines and 2 lines have been evaluated against nematodes. No report has been done yet on Fusarium wilt. 19 PR BBTV lines showed resistance to BBTV and 1 PR line each was resistant to nematodes caused by R. similis & M. incognita . Field evaluation of 2 mutant lines started in October 2004 and further observation for Fusarium wilt tolerance and plant growth was carried out. About 40% of mutant lines were attacked by Sigatoka and Fusarium wilt, while 80% were attacked by both. Irradiation of banana meristem tissues and cell suspension cultures have been carried out. Field evaluation of M1V5 generation is being conducted for Fusarium wilt resistance in hot spot areas. Study on the establishment of gamma irradiation dose has been carried out. Data on greenhouse evaluation on irradiated lines for Fusarium wilt resistance was presented. Field evaluations of promising mutant lines in the 3 rd and 4 th generation will be carried out. Multi-location farmers' trial will be conducted in Luzon, at least 3 areas where BBTV is a problem. Greenhouse and field evaluation of promising lines against Sigatoka , Fusarium wilt and nematodes will be conducted. Agronomic and yield data will be collected simultaneously with disease resistance study of promising mutant lines. Field evaluation of selected and promising Fusarium resistant mutant lines will be carried out in hot spots. Agronomic characteristics and yield data will be collected.